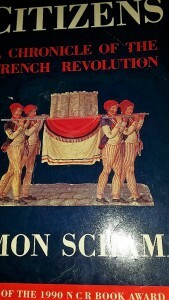 Two remarkable books about the French Revolution, one fiction, one non-fiction. If you haven’t read them and you like a meaty read, you might like to give them a try. ‘A Place of Greater Safety‘ is a glorious feast of a novel by Hilary Mantel about the French Revolution (Penguin, 1992). ‘Citizens: The Chronicle of the French Revolution‘ is a wonderful, sweeping history book by Simon Schama (Penguin, 1989). If you want to understand it and be intellectually and emotionally engaged by the Revolution, read Schama. If you want to ‘live’ it ( and learn about the human condition along the way ) read Mantel. I read both. Regularly. 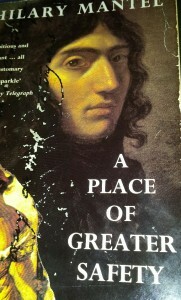 Unlike Mantel’s more recent historical novels, ‘A Place...’ didn’t win any prizes. She wrote it very early in her writing career, but couldn’t find a publisher for it. Years later, when her reputation was well established, she was asked to dust it off and see if it needed re-working. I don’t know how much work she had to do, but the book was published in 1992, to a mixed critical reception. Some critics found the shifting points of view, the time-slips and jumps, the over-laid authorial voice confusing and confused. Others, like me, found it exhilarating. Simon Schama said, in his Preface to ‘Citizens‘, that he saw the Revolution ‘not as a march of abstractions and ideologies, but as a human event of complicated and often tragic outcomes.’ Mantel’s story takes in the hopeful beginnings and proceeds to the awful Terror, but, all the time, it is through the lives of its central characters that we see the events unfold. We are introduced to ugly little Georges-Jacques (Danton) as a boy, growing up wild in Arcis-sur-Aube. Camille Desmoulins’ very existence annoys his father in Guise and Maximilien de Robespierre is the child of a pre-marital coupling in Arras. The last two meet at school in Paris, where Maximilien is tasked with looking after the precocious and already anarchistic Camille. It is the relationships between these three which lie at the heart of the novel, whatever happens elsewhere, and demonstrate perfectly the human aspect of great events. Danton and de Robespierre are held together by Camille, but ultimately cannot co-exist. In Mantel, their very natures detemine history. It is something often forgotten when we look at politicians and their Westminster machinations today – there are global considerations, economic forces, tribal loyalties and internal party politics to take into account, but it’s often personal. There is the Paris of the 1780s, with d’Anton now a bourgeois young lawyer trying to marry well and make his way in the world, meeting the hell-raising Desmoulins and forging a friendship which lasts until death. Their shared personal lives are shown alongside the unravelling of the early revolutionary hopes and the descent into violence as a means of forwarding its aims ( and, eventually, as a way of surviving ). Mantel always stands a chilly distance from her characters, but they themselves know that they are history makers and comment on themselves and events around them with dispassionate irony. Schama harks back to the great narrative histories of de Tocqueville and his like. But, at the same time, he doesn’t buy all that they offer and neither does he discard the later historiographical traditions. So social structures, the minutiae of grain prices and other economic forces get a look in. He uses the best of these (and the Marxist historians) to bolster his narrative. His grand history is book-ended by Talleyrand, the archetypical ‘survivor’. On the first page Talleyrand meets Voltaire in the Spring of 1778 and he appears in the Epilogue in 1794, visiting old friends in the Hudson Valley and planning his return to France from America. In between, Schama covers every aspect of the Revolution, across France as well as in Paris. He also tackles directly the Terror and the violence which attended the revolution from its beginning. Like the Mantel, although his book won many plaudits (and the 1990 NCR Book Award) it also attracted criticism. Eric Hobsbawm claimed that, like other British writers before him – Burke, Carlyle and Dickens, in his ‘Tale of Two Cities‘ – Schama defined the Revolution by violence and the Terror, failing to identify, or down-playing its positive aspects. I don’t agree, but I can see that, from a particular stand-point, in which the proletariat can never be free without violent overthrow, that Schama’s general treatment of what he considers gratuitous violence wouldn’t find favour. Nonetheless, I agree with Schama and I re-learn things when I return to this book. 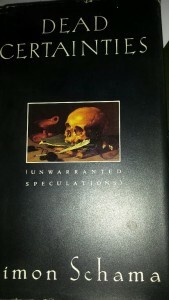 Incidentally, Schama later ventured into the world of fiction, or faction, with the slim volume ‘Dead Certainties‘ a book which is often overlooked. It deals with two, real, violent deaths and sits on my bookshelf, next to ‘Citizens‘ and ‘An Embarrassment of Riches‘ as well as some of his later tomes. Three shelves above, there are all of Hilary Mantel’s books.